Anyone else excited that sunrise is now late enough it is possible to take outfit shots then? We took advantage and enjoyed Newton Lake. Of course, later this year it will get colder and we'll have to be bundled and still be cold even then. And of course, right now it still will get hot each day, far too hot for long sleeves. Ah, but for just a few precious hours it is autumn in the air, not summer, not winter, not anything so harsh. There is a crisp note in the air, and, while the hem of this skirt is short, it is the perfect temperature to finally break out my owl sweater. I got it in the Haight District of San Francisco, my lone clothing purchase. 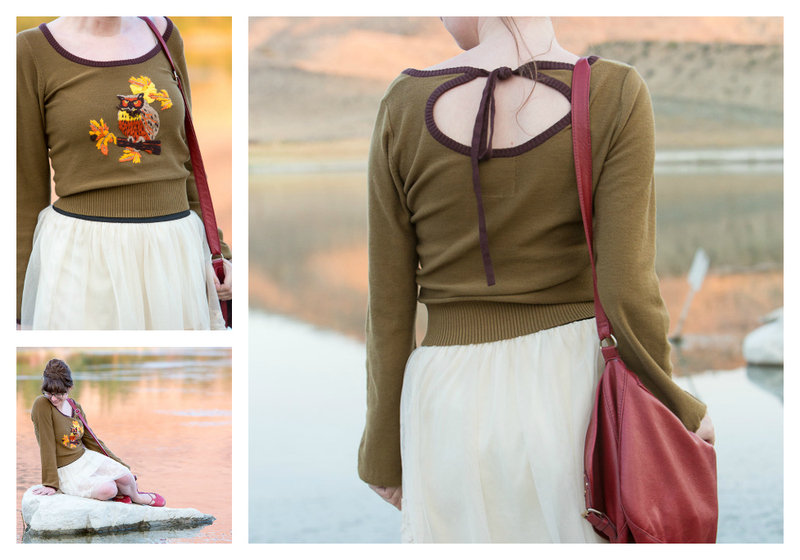 From the higher crop-top feel to the peekaboo back to the billowing sleeves, I love this sweater. Oh, sweater weather. You and I will be good friends this fall, I am sure. beautiful shoot! 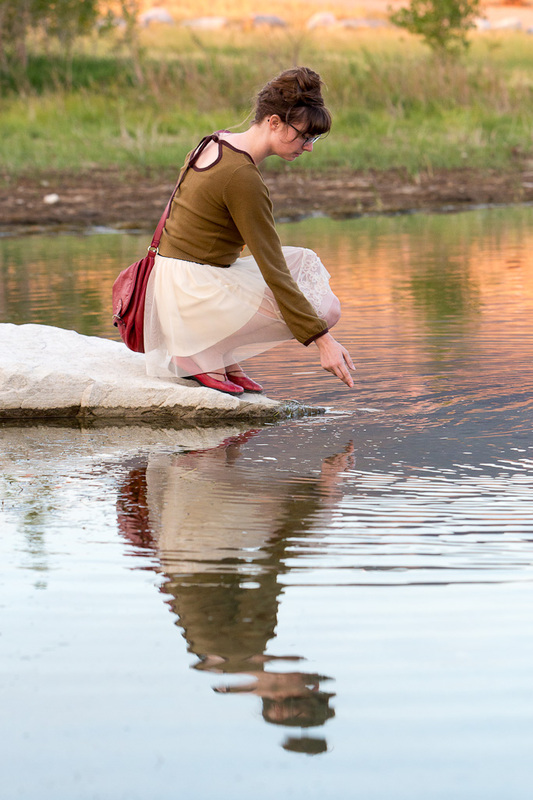 love the water reflections, colors, the sweater, and your undo! What beautiful photos! It definitely looks like autumn with the sunrise. Your hair is especially awesome! Can it be sweater weather all the time, please? This sweater is fantastic, it's so unique. I can definitely see why you love it. And it looks great with this adorable skirt. And once again, gorgeous photos! I too am looking forward to sweater weather and autumn, but not so much what comes after! 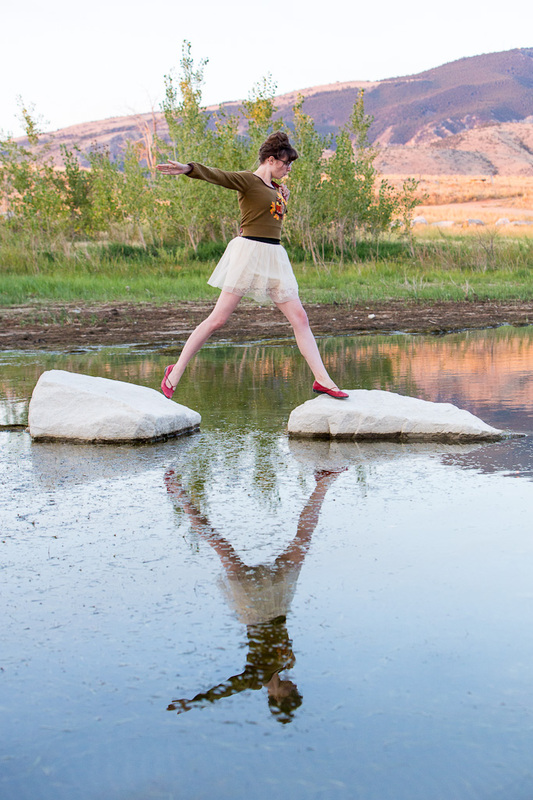 These pictures are seriously gorgeous, I love the first stone jumping one, and your sweater is perfect! I hope you're having a beautiful day! Cool outfit!I ADORE your shoes! You look so beautiful on those pictures~!! Love every single detail from top color to accessories~! Absolutely LOVE how you styled this piece and the location for this set of photos. I know this is an older post, but still wanted you to know how much I think this outfit rocks!! Oh, it is so cool to get a comment on on older post. Thank you so much Katrina.